Anticipating the implementation of the pan-European norm for fire safety in rail interiors, SABIC’s Innovative Plastics business (Pittsfield, MA) has expanded its portfolio of high-performance material solutions by adding two new Lexan sheet products to its already robust materials portfolio. These new products include Lexan H6500 sheet, a new polycarbonate/acrylonitrile-butadiene-styrene (PC/ABS) sheet grade that complies with the upcoming CEN/TS 45545 harmonized standard, and Lexan H6200 sheet, a new grade that complies with Germany’s DIN norm. Both products have been engineered to help rail customers meet growing demand for enhanced sustainability and advanced thermoplastic technologies with non-chlorinated and non-brominated flame retardance that enhance the design and development of rail interior applications. On display at the InnoTrans 2012 at Berlin Messe, Hall 5.1, booth #228, these industry-leading materials, demonstrate SABIC’s understanding of rail industry priorities and its commitment to proactively develop innovative new solutions to help its customers’ ever-changing needs. The show concludes on September 23. Lexan H6500 sheet is an opaque, solid, low-gloss PC/ABS blend that delivers high stiffness for railway sidewalls, tables and seating. Its sustainable flame retardant performance meets the requirements of the Restriction of Hazardous Substances (RoHS) directive and it delivers non-chlorinated and non-brominated product technology. In addition to CEN/TS 45545 R6 (seating), Lexan H6500 sheet complies with current European standards including the French NF F16-101 M1F1 norm (at 2-4 mm). The material can be thermoformed at a lower temperature than traditional PC materials. Its molded-in color capability can help avoid the cost and environmental hazards of secondary painting and provides excellent aesthetics. Lexan H6200 sheet, which complies with the German DIN 5510 norm: S3 SR2 ST2 at 3 mm and S4 SR2 ST2 at 4 mm, offers an attractive cost-benefit balance in less-demanding applications such as cladding. It delivers excellent impact performance at low temperatures (ductility down to -20°C), good colorability and excellent thermoforming at lower temperatures than standard PC materials. 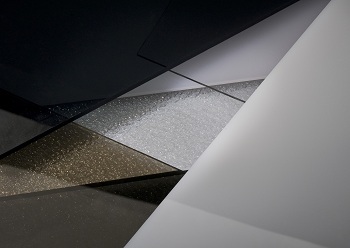 Compared to metal, thermosets and glass, both new Lexan sheet materials can significantly lower system costs through consolidation of parts to streamline production, avoidance of secondary operations such as painting and coating, machining and polishing, and lower shipping costs by reducing weight. Further, Sabic offers an Ultem sheet solution based on polyetherimide (PEI) resin that features inherent flame retardancy and low smoke emission, complying with the new CEN/TS 45545 standard at the highest level (Hazard Level 3) for R1 applications (Requirements for interior components) across all four occupational categories at 3 mm. Lexan H6000 sheet is a high-modulus PC/ABS product that meets French NF F16-101 M1, F2 at 2 mm and German DIN 5510 Part 2 S4-SR2 ST2 norms at 3 mm and has a UL94 V0 rating at 1.5 mm. Lexan H6000 sheet provides environmentally responsible flame retardance according the German DIN-VDE 0472 part 815 norm and complies with the Polish norms for side wall and ceiling applications (PN-K-02512, PN-L-02501, PN-K-02505). Potential applications include sidewalls, tables and seating. Lexan F2000 sheet, available in clear transparent and translucent opal white colors, is a flame retardant, lightweight product that can be an excellent choice for light diffusers and light covers. It offers ease of processing, excellent formability and can help achieve part integration in train ceilings with light diffusers. It complies with CEN/TS 45545 standard for R4 (Requirements for lighting components), German DIN 5510 S4 SR2 ST2 norms at 3 mm and French NF F16-101 M2 F2 rating at 2-8 mm.